This is the "Orange Day" of the Rainbow Challenge. 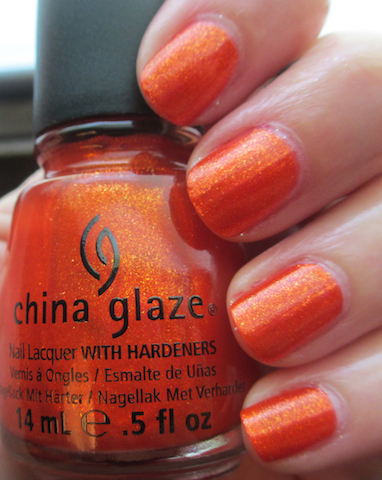 I didn't even have to think - China Glaze Riveting would have to be my favorite orange. This is the only polish from the Hunger Games Collection that I picked up and I just love it. It's so bright! It's like the orange version of Ruby Pumps (I wore that yesterday). Check out the rest of the nail bloggers taking part in this challenge! Riveting is definitely a huge favorite of mine as well. Such a great polish. It is in the same family as Ruby Pumps for me, goes on easy and has a great shine to it! Gahh!!! SO MANY TIMES have I picked up and put down Riveting and I'm already regretting not just getting it, because I can't find it around here any more. Anyways, I'm glad you chose it because it looks so freakin' cool! This looks lovely on you!! I thought about getting this one and always passed it up...now after seeing it on you I wish I had it! I agree that it looks like the orange version of Ruby Pumps! Super cute! ruby pumps!love this so much!